This exhibition at the UBC Museum of Anthropology has grown out of a unique opportunity to present the personal experiences of First Nations children who attended St. Michael’s Indian Residential School at Alert Bay, British Columbia. During the late 1930s, one student at the school had a camera and photographed many of her friends and classmates there. She recently donated these images to the Museum of Anthropology’s archive. The photos provide a rare and moving glimpse of residential school life through the eyes of students as they made a life for themselves away from families and home communities. St. Michael’s Indian Residential School operated from 1929 to 1974, and its now-empty building is in deteriorating condition. With the support of the U’mista Cultural Centre (UCC) and the ‘Namgis First Nation at Alert Bay, MOA curator Bill McLennan was recently permitted to enter the building and photograph its interior spaces where the children had lived and worked. The resulting images, together with those of the students, are featured in Speaking to Memory, an exhibition jointly produced by McLennan and the UCC’s director Sarah Holland and curator Juanita Johnston. In Alert Bay, Speaking to Memory will be hung around the exterior of the St. Michael’s school building, located beside the cultural centre. At MOA, the exhibition will be presented in our O’Brian Gallery. The large photographic panels depict the interior rooms of the school as they now appear, overlaid with historical images of the children. Accompanying the images are personal statements from former students of St. Michael’s school, recalling their experiences there. 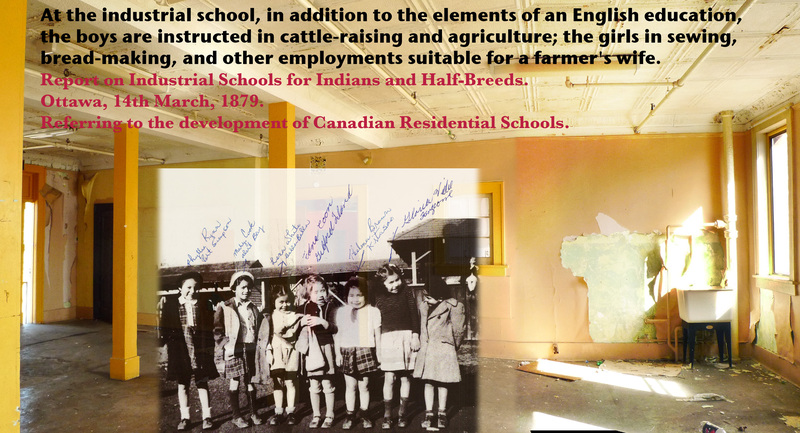 Quotations from a variety of sources express the Canadian government’s rationale for Indian residential schools, while excerpts from the 1996 Report of the Royal Commission on Aboriginal Peoples recognize the devastating impact of the schools. In addition, one “artifact” is featured in MOA’s exhibit: the institutional food-mixing machine, recently salvaged from the school’s kitchen. The Indian residential school system was implemented in 1879 by the Canadian government to eliminate the “Indian problem”—that is, to absorb the Aboriginal population into the dominant Canadian identity, and to impose Christianity, English or French as the primary languages, and the abandonment of cultural and family traditions. St. Michael’s Indian Residential School in Alert Bay was one of 140 Indian residential schools that operated in Canada.